Upload the folder simple-yearly-archive/ to your /wp-content/plugins/ folder. Upload the folder simple-yearly-archive/ to your /wp-content/plugins/ folder and overwrite the existing file. - yearly: Displays a year-based list (Default). Can be empty aswell. - yearly_act: Only posts from the current year are displayed. - yearly_past: Only posts from the past years are displayed. - "date of year": Only posts from the given year are displayed. - "<unixtime-from>-<unixtime-to>": Only posts from the given (unix)time period are displayed. - A comma-separated list of category IDs you want to exclude. - A comma-separated list of category IDs you want to include. - A registered post type to show. - The date format string, according to http://php.net/strftime. There are a couple of options in the Simple Yearly Archive options menu. The date output be customized. Check http://php.net/strftime for date formatting. The seperator is displayed between the date and the post title. Wanna have the years linked? HTML tags, that will be inserted before and after the date headlines. Show the total post count behind for each year? Show comments count behind each post? Show categories behind each post? The output can be styled with the CSS class sya_categories. Show the optional excerpt below each post title, if available? How much chars of the excerpt to show? Enter 0 to show the entire excerpt. How much pixels the excerpt should be indented. Consider linking back to my homepage in the plugin's footer. How do I get to display the archive as in your demo. Hello, I have installed the plugin, but need help in applying it on my archives. Kindly help. When I quick on a specific year, for instance 2018, X number of posts are displayed under 2018. My question is if there’s any way to display every posts under every year without having to click on each year. I’d like visitors to click on the page where I have the archive and already be able to see each posts under each year without having to click on them. Sure, just uncheck the option “Collapsible years?” in the plugin settings. So is there a way to make it so that it will limit the list to a user defined period based on the current time? Like only posts from the past week or month? Or perhaps limit the total number of posts, like only displaying the last 200 posts? Thanks. As for limiting the list by time period please take a look at the “Implementation / Usage” section on this page, specifically the “type” parameter. Thank you so much! That last bit to limit by number of posts worked like a charm! Thank you so much for such a wonderful plugin! Because the digits in the font I use have different widths, I cannot find a way of getting the first character of my titles to line up perfect vertically in the archive list. Can you suggest a way of achieving this with the current release? If not, would you kindly consider some feature to allow this in a future release? you could give the dates a fixed width with CSS, e.g. Many thanks, Oliver. I’ll give that a try. great plugin – I’ve been looking to implement a yearly archive for quite a while. CSS is clearly structured, the options are great. I only miss one feature: I’m using some custom image sizes which are registered with the WordPress media library. Would it be possible to use one of these image sizes instead of the five standard ones? (I don’t want the features images to get cropped). Hi Ritchie, actually your custom image sizes should appear in the plugin’s thumbnail drowndown for your to select. Doesn’t it for you? Is there a way i can make the yearly achieve list to show on another page if the list is too long? then we have a NEXT BUTTOM to go to another page. Hi Elisha, you can use the “type” parameter, e.g. Hello, is there any way to configuring the plugin to display the post title followed by the date? where i replace x by the category name. But it doesn’t work. The category is not excluded. Can you hepl me with this? Thanks for the plugin, very great! There’s only one thing that I am not getting fixed. I use collapsible years, but I can’t find a good way to hide the bullets at every result of the output. Do you have a solution for me on how to hide these bullets at every list result? Hi. I´d like to show in yearly archive only posts with one certain category (let´say the category ID is “15”). Which shortcode I have to use? where x is the category ID you’d like to show posts from. I installed Simple Yearly Archive earlier this year using the [SimpleYearlyArchive] shortcode. All I want is each year to display in the list, with the year being hotlinked to a list of posts for that year. And that’s how it displayed when I originally installed the plugin. But now, below the year, it’s displaying the title of each post along with the year. i.e., in a list format. I have changed nothing since the initial install. Everything looked fine at the time (only the hotlinked years displayed in the list). I’m running WP 4.9.8 in Astrid theme. All other checkboxes are empty. Please let me know what I need to do to go back to my original display (years only). > But now, below the year, it’s displaying the title of each post along with the year. i.e., in a list format. actually that’s what the plugin always was supposed to do. Just change “Date Format: Y” to “Date Format: m/d” to get rid of the year in front of the post title. The “Collapsible years” option should just show the years. May you please post a link to your archive page? I’m assuming the excerpt should be inside of cite but as you can see, nothing ends up being put there. The post does have content. I’m realizing your comments permit HTML to be rendered. I meant to say, I’ve got the date span, the a title and a div containing a cite element which is empty. ouch, yes, that’s exactly what I was missing. Thanks! Is there a way to take our archive of membership newsletters (in pdf format) and trick it to be a dated “post” so that I can use this tool? A last question until I have my archive exactly as I want it. I have a bullet showing between each post line, not in front of it. How do I rid myself of that? Looks like a layout issue, but I can’t really help here without a link to your archive page. It’s the first part of the work on this web page. I’ve added it to the theme’s, Customizing, Additional CSS screen but see no change. I also re-saved the page using Simple Yearly archive. 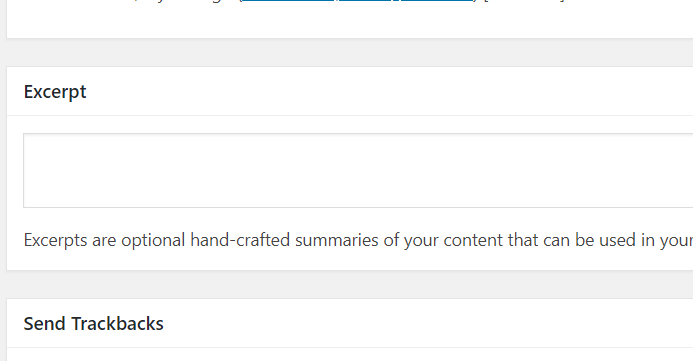 It’s probably a case of I need to know more about WordPress’ editors and usage of them to see where I’m going wrong. Thank you so much for taking the time to look at it for me. It amazes me how helpful you are willing to be. Yeah, can’t see your custom CSS either. Have a caching plugin running? is it possible only to show the years as a link? If i uncheck every option except only linked years – i have exactly what i want PLUS Date and title. I have to avoid Date and title in this case. would be glad to have an answer. checking the option “Collapsible years” should do the trick. Hi! I am a completely newbie. I found your plugin and I am still learning how to use it. I successfully managed to create an Archive to show all my posts chronologically, which is what I wanted. Now I want to change the color of the post titles (from my theme’s ugly red to my favourite blue). Searching online I get a lot of suggestions to add code to the Additional CCs, but none of them are working for me. I wonder whether this is something that is related to the plugin? Is there any way the plugin might be interfering? Or can I use it to change the colors? Just change “blue” to whatever color you want. Wow, I can barely believe it, but it worked! Thank you so much! Hello I would like to display the number of articles of a year in a category how to do it? Thank you. Is it possible to write some code to chose the year’s color? Again, thank you so much for what you do, it is greatly appreciated and makes donating to these kind of projects a pleasure. I have just installed the program and get the following output on a page that uses [SimpleYearlyArchive], The problem is that the bullet is on a separate line. Possible cause of wrong format could be in the simple yearly archive settings page, the input box Max. chars of Excerpt (0 for default) has “100” entered and I cannot remove it or change it. I have tried clearing my cache, but to no avail. It should not matter as – Show optional Excerpt (if available)? is not checked. that seems like a CSS issue to me. May you please provide a link to your archive page so I can have a look at it? As a wild guess I think setting the links to display:inline; will do the trick. I have a question similar to Elisha. I have approximately 1300 posts throughout the years. I would like to know if it is possible to limit the total per page, regardless of the year. Or even still, just have it create a new page on a per year basis. That way when someone clicks the archive page, they still have access to all of the archives, but they are not on a single page with 1300 results. Hi Billy, the plugin does not offer pagination or automatic creation of year-based archive pages, but a solution would be to create two pages: one for listing current year’s posts and one for all the other years’ posts. This way you wouldn’t have to creat another archive page for each year because the page with [SimpleYearlyArchive type="yearly_act"] on it will always display the current year’s posts. Apart from that there are ways to limit the number of posts being listed by using WordPress filters but you wouldn’t have pagination. Hi jlm, enabling the option “Show post count for each year?” should do the trick. I misspoke what I meant was to display the number of articles of my category in particular. Hello, and thank you for a wonderful plugin! I am wondering if it’s possible to have the list of posts expanded by default, so that the user will see the list of posts without clicking on a year? Or, perhaps even better, that the most recent year is expanded by default, and the previous years will expand when clicked? Sorry for asking if this question is already answered here – I found it quite impossible to navigate and search the comment section here. 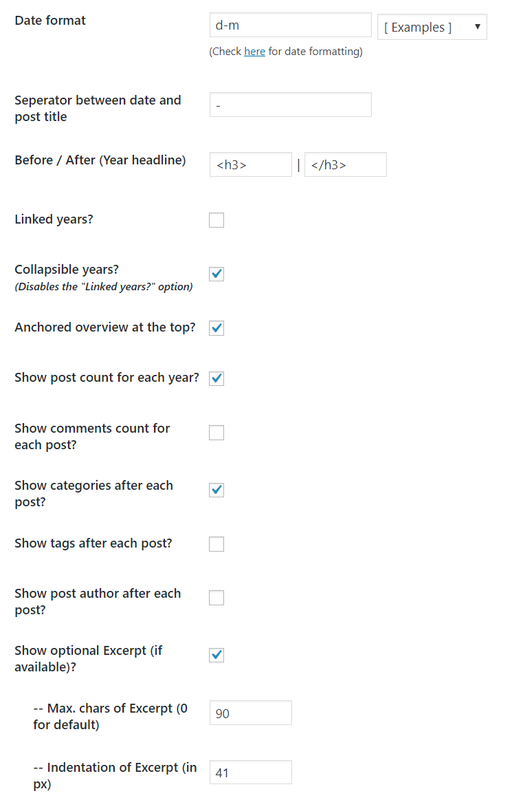 Hi Eivind, the list of posts is expanded by default for all years unless you enable the option “Collapsible years?” in the plugin settings. So if you have the checkbox checked, unchecking it will do the trick here. Thanks in advance and all the best!! Hi Joerg, https://wordpress.org/plugins/compact-archives/ is what you’re looking for. Hi. I’m trying to use your plugin in a sidebar as an archive menu. Is it possible for the list of posts (within a year) to stay open when clicked and for the active post to be highlighted when this post has been opened? Hi Kris, unfortunately that’s not possible with this plugin. hallo, danke für das einfach und praktische plug-in. gibt es eine möglichkeit es für custom-post-types zu nutzen? ich nutze das CPT UI plug-in immer wieder um seiten besser zu strukturieren und da wäre es toll, das yearly-archiv auch dafür nutzen zu können. ah, ich stand auf dem schlauch – danke für die schnelle hilfe!